Fully improvised, live solo piano from the guy who made it famous—proving why he’s still a master. Pianist Keith Jarrett is the most brilliant and essential jazz musician of the last 40 years. Okay, that a crazy-bold statement. Jarrett is not the “best” maybe, and certainly not the easiest to enjoy or to fit into a category. But in many ways he encompasses most essentially the turbulent and wonderful history of the music since Miles Davis, John Coltrane, and Ornette Coleman passed their prime. And his new solo piano recording, Rio, is his best work in a very long time. Which is to say: it is one of the essential recordings of the year. It’s not popular or simple to hold up Jarrett as a paragon. He has done plenty to offend whatever might be called the “jazz establishment”, including being contemptuous of audiences who dare even to cough or sneeze during his concerts. He has made many classical recordings (usually a suspicious move in jazz) and he’s been bold enough to let that sensibility bleed over his jazz playing. He has flirted with fusion, mainly in playing with Miles Davis in the 1970s, which is an offense again purity, but he has also been a Marsalis-esque prude in other moments, eschewing electric instruments and playing a strict diet of older compositions with his “Standards Trio”. But in fact Jarrett has been at the center of jazz’s creative core for decades. He has played fusion, yes, but the very best and most adventurous of that style’s early work. He has also played beautifully and consistently in avant-garde styles, moving easily beyond bebop or post-bop harmonies into “free” territory both with his bands and as a solo player. With Charles Lloyd and then on his own he helped to define jazz as a music that could touch on popular impulses without being merely a finger-snapping gloss on the hit parade. His classical playing has been assured and fine (particularly his recordings of music by Bach, Handel, and Shostakovich), and that work has informed all his playing in subtle and substantive ways. He has challenged himself by working with great musicians of his generation from both the U.S. and Europe. Most pointedly, Jarrett has done the one thing that is truly required of all great jazz players: he has developed his own, immediately recognizable sound. And that voice is most clearly recognized when Jarrett plays—famously—as a solo artist. Since The Koln Concert in 1975, ECM has been releasing examples of Jarrett’s remarkable, fully improvised solo concerts. Jarrett claims to begin each of these concerts with no preconceived notions of what he will play, and the recitals allow him to spin a world of sound that is wholly his. 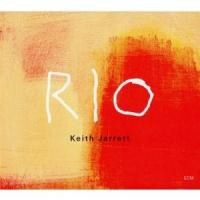 Rio is the most brilliant Jarrett solo recording in recent memory. Rather than improvising in a longer, more rambling form, Jarrett works here in shorter statements, each focused and concise. In 15 very different miniatures, Rio demonstrates the pianist’s astonishing facility for generating not only grooves or settings but also developing webs of melody and counter-melody. From free playing to blues to gospel to aching ballads, Jarrett covers a vast landscape of piano. Some of the pleasures of Rio are familiar. “Part VIII” starts with a jaunty Jarrett gospel figure that sets your ears up for enjoyment. The harmonic movement, however, goes well beyond the usual blues or gospel moves, and a certain baroque precision emerges in the improvised melody. “Part XI” is a blues, straight up, with a modified boogie bounce in the left hand, and by staying under four minutes the performance comes off as a modest but tasty bit of tradition. When the concert turns contemplative, there are also traditional enjoyments to be heard. Jarrett is simply a superb spinner of melody, and the ballads here are remarkably focused. “Part XIII” aches with feeling from the start, making you wonder how it could truly be spontaneous. Jarrett starts with a simple descending chord figure, then a single-note melody takes the composition away. That descending chord figure is not all there is to the song, as new daylight seems to break over it every dozen bars or so. If you’ve never heard what Jarrett can do at his best, this track is something that might provoke a sharp intake of breath. Beyond these moments, Rio manages to be equally good—and more surprising. “Part X” is a scribbly run of melody without a clear harmonic center that starts as two hands in octaves, then breaks out into twin harmonized melodies that keep the same rhythm. Eventually the two hands become more and more independent, weaving like two starry arcs in the night sky. “Part II” is an impressionist exercise that stays interesting by mixing textural shimmers and humming overtones with a stately melody that emerges over time. “Part V” begins with a classic Jarrett trick, a telegraph-tapping ostinato note around which the pianist adorns the tune with spirited chording. But this performance develops into what almost seems like a pop song, with the melody staying consonant and a rising “chorus” that recurs. It’s a celebration. From the very start, this concert has a blessing about it. “Part I” stands out as a successful amalgam of Keith Jarrett’s best impulses. At every turn, this improvisation resists the easiest move or the plain repetition. It doesn’t “swing” in any regular way, but it has a pulsing forward momentum that keeps it vital. The harmonies are not entirely beyond tonality, but there is great freedom as the piece develops. It feels, truly, like a piece of music where “anything can happen.” It makes the best possible case for these solo recitals being something that is not vaguely half-planned out. Perhaps these qualities of “Part I” are the reason that Rio is best listened to in order, start to finish. Jarrett’s artistry here is not just within each piece but also in the architecture of the whole recital. “Part I” is a powerful thesis statement for the whole evening, and following pieces (almost all shorter) break out Jarrett’s ideas into component parts—joyous, contemplative, lyrical, caustic, dancing, blue, still, shouting. Rio is a full range of emotion, created on the spot. All these years later, Keith Jarrett remains great.